Nature photographers plan, and plan, and plan some more, but no amount of planning can overcome the fickle whims of Mother Nature. So when all of nature’s variables click into place, euphoria ensues. On the other hand, few things are more disappointing than a long anticipated and perfectly executed shoot washed out by conditions beyond my control. (For a photo workshop leader, with the happiness of other photographers in the balance, the emotions of these planning successes and failures are magnified many times.) But just as Mother Nature can thwart our best laid plans, sometimes she takes us by complete surprise and more than compensate for the myriad disappointment. As many of you know, Don Smith and I just returned from two weeks photographing the Grand Canyon. We did a little of our own photography on the trip, but the prime focus was our two four-plus day photo workshops split evenly between the Grand Canyon’s North and South Rims. 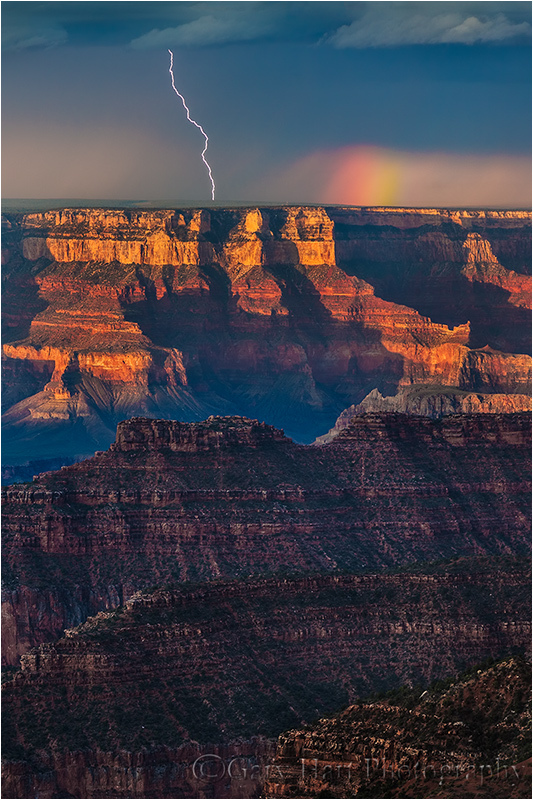 These workshops were “designed” to give everyone the opportunity to photograph the Grand Canyon, day and night, under the influence of its annual Monsoon season: billowing clouds, vivid rainbows, and lightning. Especially lightning. 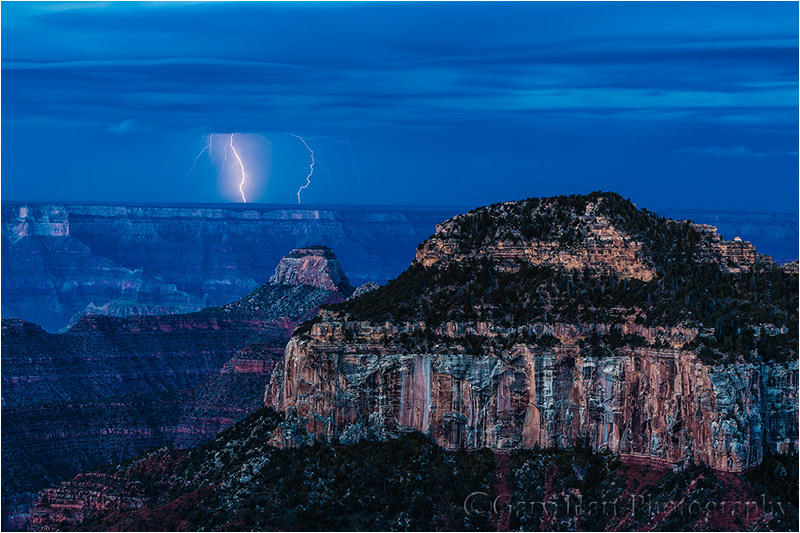 But any workshop requiring specific weather conditions is fraught with uncertainty and anxiety—we were fairly certain the photography would be great (after all, it is the Grand Canyon), but few natural phenomena are more fickle than lightning. But back to that planning thing. When organizing a workshop schedule (or, for that matter, any landscape photo shoot), the best a photographer can do is maximize the odds: We try to schedule all the non-photography requirements (meals, sleep, travel, training) for the times least likely to conflict with the best photography. 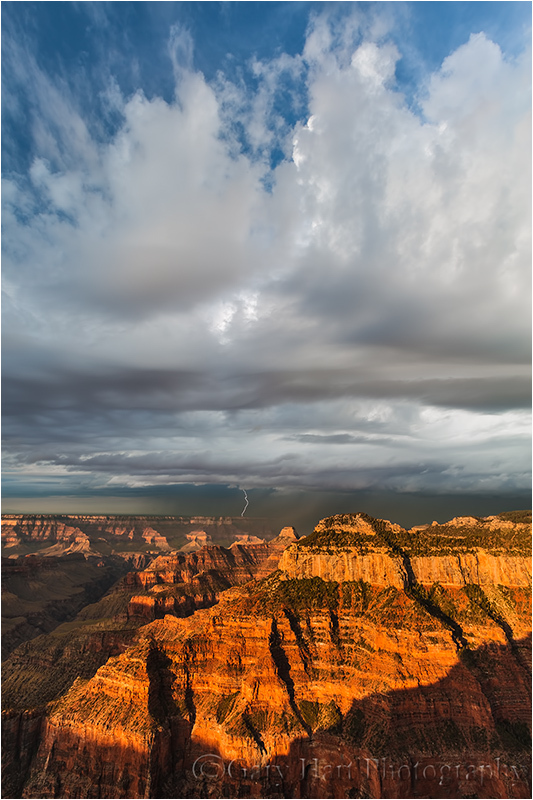 For example, we know that because Southwest Monsoon thunderstorms usually don’t develop before midday, Grand Canyon summer sunrises usually lack the clouds and pristine air necessary for the vivid color photographer’s covet. Therefore our photography emphasis for this trip was always on getting our groups out from mid-morning through (and sometimes after) sunset. That doesn’t mean we blew off sunrise, it just means that the sunrises are generally better for exhausted, sleep-deprived photographers to skip than the sunsets are. Nevertheless, Don and I rallied the troops at 5 a.m. Friday for the final workshop’s final shoot at Bright Angel Point, a five minute walk from our rim-side cabins. We’d already had so many wonderful shoots that we knew everyone would be going home with great images—this final shoot was just a little bonus, the cherry atop an already delicious sundae. In fact, as Don and I exited our cabin in the pre-dawn darkness, I predicted that I wouldn’t even take my camera out of my bag that morning—my words as I turned the doorknob were, “But if I leave my bag here, we’ll probably get lightning and a rainbow.” Little did I know…. What followed was what Don and I later agreed was probably the single most memorable workshop shoot either of us had ever experienced. The lightning was already exploding the darkness across the canyon as we set up at the Bright Angel Point rail. Not just the single, infrequent strikes we’d been photographing all week, but numerous, violent strikes in multiple directions illuminating the black canyon several times per minute. The pyrotechnics continued for over two hours, awing us first in the dark, then through twilight, and finally into and beyond a magenta sunrise. And as if that wasn’t enough, as the sun crested the horizon behind us, a small but vivid rainbow fragment materialized on the canyon’s rim and hung there like a target for the lightning to take potshots at it. This was more than just good photography, this once-in-a-lifetime convergence of weather, location, and light would for everyone present likely become the standard against which all future natural phenomena would be compared. Arriving on the rim about 45 minutes before sunrise, we found the South Rim under full attack. This 30 second exposure captured a pair of strikes near Mojave Point. The main event was clearly in the west, but as the sun neared the eastern horizon, I couldn’t help sneaking an occasional peek behind me. Seeing clear skies in the rising sun’s direction, I crossed my fingers for the clouds to hold off long enough to allow the sunlight to illuminate the lightning show before us. (But I didn’t dare wish for a rainbow.) As the sun topped the horizon, its rays caught the rain falling along the rim, balancing a nearly vertical section of rainbow atop Powell Point. In this singe, 1/3 second exposure I managed to capture the rainbow briefly sharing the rim with three simultaneous lighting strikes. The rainbow persisted as the lightning continued. Confident that I’d captured enough horizontal frames, I switched to a vertical composition in time to catch one more strike with the rainbow. As the sun rose, the rocks reddened and the storm edged closer. Ridges visible earlier were slowly overtaken by the advancing rain, and long, rolling waves of thunder echoed overhead. Preceding the rain were billowing clouds; here I went with an extreme wide (17mm) vertical composition to capture the incoming storm skewering the rim with by a single bolt. The energy of each person in the group that morning was like that of a five-year-old at Disneyland. And even Don and I, the seasoned pros who get to witness nature’s magic all the time, remained giddy for the entire 800 mile drive home. These unexpected gifts of nature are important reminders that photography is so much more than a job to us. Thanks, Gail. It isn’t announced yet, but it looks like next year’s Monsoon workshop will be August 9-13. It’s too wonderful to lay simply to chance, to think it’s all caprice and circumstance. It brings too much joy to attribute it to good fortune alone, or to dumb luck. There was Something at work that day that almost seemed to intend to delight you. Thanks, Cal. It really does feel that way sometimes. Gary does some wonderful landscape photography. I hope you’ll consider following his blog. Special images and a great job of letting us live the experience through your story telling! Gary, you are fast coming to #1 on my list of favorite photographers. I have become a Gary trekkie. Your photos speak to me. Thank You!!! Thank you, I’m glad you enjoy my photography. Glorious images, have my trigger on order, bags almost packed, not that I am anxious or anything. It’ll be a blast, Patsy. These are fantastic, Gary…. and a bonus rainbow. Is the lightning captured solely with a long exposure (and good timing) or do you always use a lightning trigger? Love this post and your work, as always. Thanks.